Among the hundreds of native plant species at Rock Creek Park, a few are of particular note and are worth a closer look. Several plant species at Rock Creek Park are of special conservation concern. For these, see Species of Concern under Stewardship and Ecological Threats. 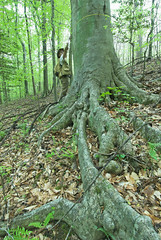 Two plant species stand out at Rock Creek Park for their age or abundance: American beech and chestnut oak. Roots of a large American beech (Fagus grandifolia). Some of the oldest trees in the park are a couple of American beeches in Glover-Archbold Park that escaped cutting during extensive forest clearing in the Civil War years—they are now likely several hundred years old.1 You can see them near the western boundary of Glover-Archbold Park, just south of W Street, on a mapped side trail that leads from W Street to the intersection of Whitehaven Parkway and Glover-Archbold’s main trail. Map tip: To find this location, go to the interactive map of Rock Creek Park and search for "large beech." Chestnut oak is another signature tree at Rock Creek Park. Highly fire-tolerant and able to grow on extremely acidic soils , this oak is found on many dry hilltops and steep slopes locally. Its leaf shape is similar to that of the American chestnut. Map tip: To find this location, go to the interactive map of Rock Creek Park and search for "large chestnut oak." However, it is Battery Kemble Park (administered by Rock Creek Park) that boasts a national title-holding champion chestnut oak tree. From a single tree that was felled grew eight trunks. They share the same root system, so they're considered one (huge!) tree. The tree was probably originally cut down in the making of this Civil War lookout point. 1. Fleming T. 2008. Personal communication. 2. Fleming T. 2008. Personal communication.